Remember when I said that The Hundreds flips the script? 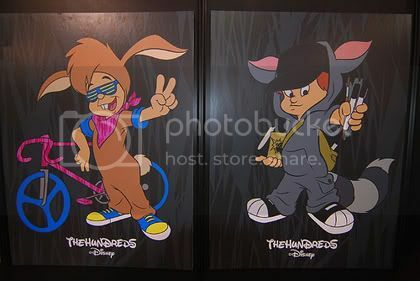 This is The Hundreds take on the Lost Boys. I actually saw this before but didn’t think the collabo was anything official. Surprising that Disney would lend out their name to the streets. I’m not really a huge flan of the stutter shades/neckerchief rendition, but it’s still pretty fresh. That logo in Disney font is amazing. Thanks to Shaun Will for refreshing my memory. This entry was written by casanovaruffin and posted on September 8, 2008 at 11:44 am and filed under Announcements, Critiques with tags Disney, Lost Boys, neckerchief, stutter shades, T-shirt, The Hundreds. Bookmark the permalink. Follow any comments here with the RSS feed for this post. Post a comment or leave a trackback: Trackback URL. The Lost Boys and The Hundreds actually first collaborated back in…2005?….if I remember correctly. They had tees in a couple of colors, using a little bit of a twist on a profile of the animated Lost Boys from the 1953 Disney version of Peter Pan. Looks like they’re both throwing down again for Magic 2008.